There comes a time during virtually every aspect of American pop culture and entertainment, whether it be a political movement, an exciting new style of music, a new trend or dramatic approach in the field of the Silver Screen, or a revolutionary period in the field of professional athletics, where a single iconic figure manages to rise above the proverbial crowd and become a magnet for adoration and idolatry, a virtual pulsar of energy who seems to exude allure and charisma like none other in history. Be it John F. Kennedy, Dr. Martin Luther King, Elvis Presley, James Dean, Marilyn Monroe, or Jimi Hendrix, these American heroes clearly transcended the levels of expectation, as well as appreciation previously seen in their respective fields, much the same way as Babe Ruth, Gordie Howe, Bobby Orr, or Wilt Chamberlain, did in the world of professional sports. 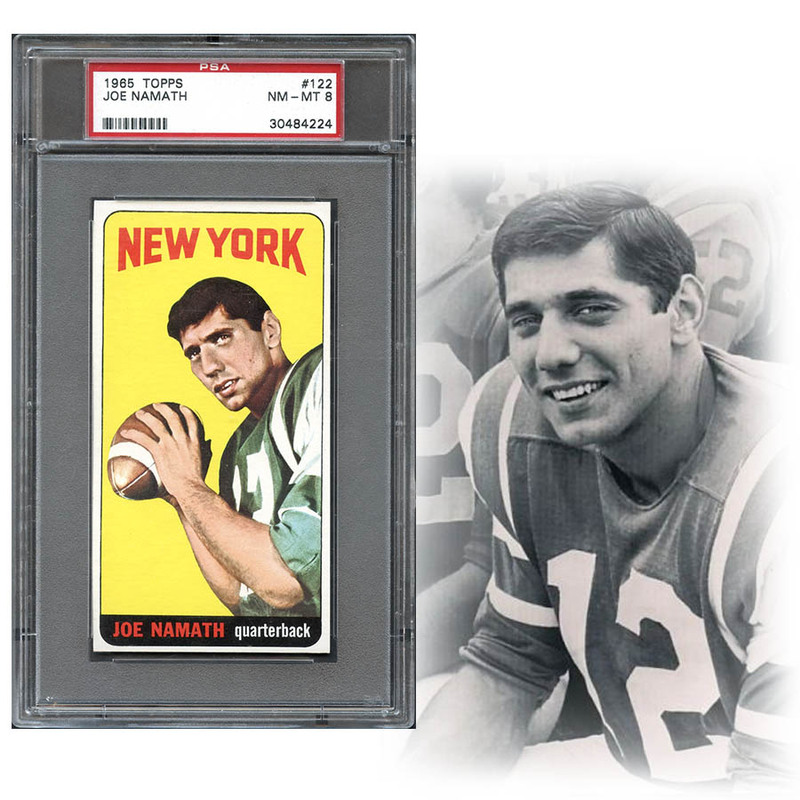 But in football, such a level of idolatry had not been achieved until the arrival of Joe Willie Namath. Bold and brash, young and confident, intriguing and exciting, Joe burst forth upon the professional football world with all the audacity of a champion bullfighter at a sheep herding contest. It would not be for another four years until his famous guarantee of a victory over the heavily-favored Baltimore Colts in Super Bowl III when his inaugural card appeared as part of the innovative 1965 Topps football release. It's only fitting that his first cardboard appearance should be on the "Tall Boy" cards produced that year, as no ordinary canvas would be capable of housing his larger-than-life persona. The offered example has emerged from the PSA grading room with a NM/MT 8 designation, an alluring assessment that accurately reflects the strength of the condition-sensitive issue. The bright yellow backdrop is devoid of any readily visible stray print marks, as are the clean, white borders, and the central image is registered to near perfection. Corners easily fall within the parameters of the assigned grade, while the reverse is well-struck in bold black and salmon pigments. 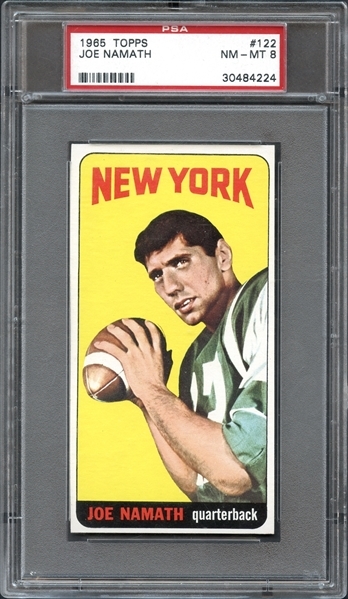 Were the centering just slightly more accurate on the front, this one would most likely be in a higher-grade holder, but the overall visual appeal is nothing short of spectacular. 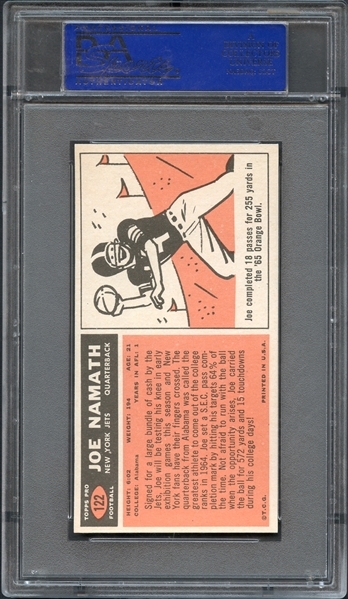 To date, just 8 examples have graded higher at PSA, so if you seek a true hobby masterpiece that doesn't often surface in this condition, you'd better go for this one!